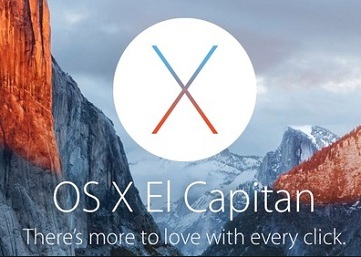 Apple Inc. just updated its famous Mac OS X El Capitan to the latest version 10.11.4 on March Event which received wide range reputation. To find an appropriate DVD ripper for Mac El Capitan to rip DVD on Mac OS X 10.11 becomes the common issue for both Mac geeks and DVD fans as a matter of course. You will never guess it how many people focus on the issue since there is a statistics that Mac users' number reaches to 93.96 million in May 2010, not to mention today's data. Are you one of the enthusiastic Mac lovers? Well, if you are indeed a Mac user and happen to be a DVD zealot who are willing to rip DVD on Mac OS X El Capitan in case of damaging and scratching, a DVD ripping program on El Capitan is definitely a must. Among loads of DVD ripping softwares, what the best DVD converter for Mac El Capitan to rip DVD to utmost perfection? 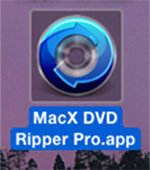 MacX DVD Ripper Pro or Magic Mac DVD Ripper? As a DVD ripping software on El Capitan, MacX DVD Ripper Pro is definitely granted for all the praises. With unparalleled technology, it is perfectly compatible with Mac OS X El Capitan/macOS Sierra/high Sierra/Mojave, which allows you to rip both homemade and commercial DVD to various video formats such as MP4, MOV, M4V, MOV, MKV,FLV etc and backup DVD to single files meanwhile. That is to say, you are freely to rip DVD to iPad Pro, iPhone X/8/7/6S/6 (Plus), etc. for limitless playback without a hitch and copy DVD for storage at the same time. Moreover, this amazing DVD decrypter on El Capitan as well as other Mac OS is capable of unlocking all DVD protections such as CSS, UOP, REC, APS, Sony ARccOS and Disney X-project so as to rip the new DVD movies. Magic Mac DVD Ripper is a quick and easy-to-use DVD ripping software, which allows you rip DVD to common formats like WMV, MP4, AVI, etc., too. Likewise, it does well in decrypting DVD on Mac, removing CSS, Region, RCE, Sony ARccOS, PuppetLock DVD protections. However, its library of customization profiles is limited and has small range of smartphone and tablet optimized choices. But the most important problem is that it DON'T compatible with Mac OS X El Capitan, not allowing you to rip DVD on El Capitan/Yosemite. That's a shame. 2. Rip any DVDs. Remove all the restrictions of DVD (CSS, Region, RCE, Sony ARccOS, PuppetLock) for Mac OS. 4. Choose any clip of DVDs to rip. Well, it could be completely vacuous only for function features. To have a deeper insight about these two El Capitan DVD copy software, we tried to rip DVD to MP4 severally with MacX DVD Ripper Pro and Magic for testing the DVD ripping speed, output video quality, size etc. As you can see, both the two best DVD ripper for Mac El Capitan can convert THOR DVD to MP4 without any hassles. But obviously, the one from MacXDVD works better, within a fast DVD ripping speed, and smaller MP4 output video, though the testing results may be various due to the different configuration of your Macbook Pro/Air, iMac, Mac mini etc. Ps. 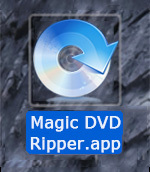 Magic DVD Ripper was tested on a OS X 10.9 Mac since it hasn't updated for a long time. Nevertheless, there still someone are querying why not convert DVD on El Capitan with free Handbrake? Of course, you can. But since Handbrake cannot rip protected DVD alone, it works only tuned with some third-party programs such as VLC. But Mac OS X El Capitan's new security system, "System Integrity Protection" apparently broke Handbrake ripping copy-protected DVDs by removing libdvdcss. So you have to download and install libdvdcss for Handbrake if you wanna rip copy-protected DVD with it on El Capitan. It's really troublesome right? So you might as well convert DVD with an easier Mac DVD ripper. Here we go! 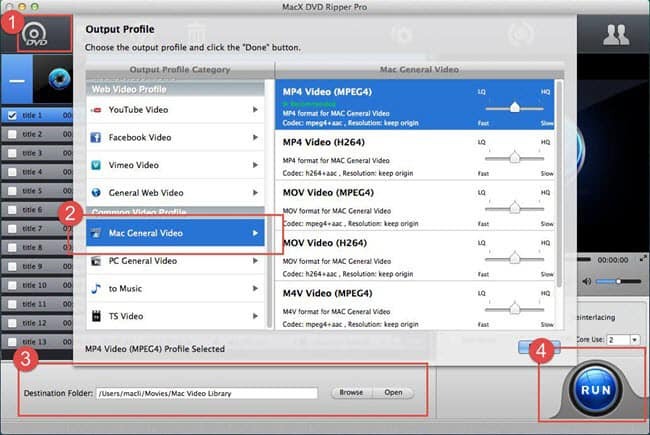 From the contrast above, you can find that MacX DVD Ripper Pro is more appropriate for ripping DVD on Mac OS X 10.11. By the way, if your hardware equipment is good enough, the DVD ripping speed can be achieved up to 5 mins, thanks to the hyper-threading and multi-core processing. Here we go to check how to rip/copy DVD on Mac El Capitan or macOS Sierra. 1 Add DVD. Free download this top DVD decrypter yet ripper and launch it on your Mac. Load your DVD by clicking the button on the upper area. 2 Determine the output format. Then, click "Mac General Video" from the "Output Profile". The program offers you plenty of output formats like MP4, MOV, M4V etc. 3 Specify the output path. Specify the destination folder by clicking "Browse" button. 4 Start Ripping DVD. After steps above, tap "RUN" button to start to rip DVD on Mac OS X El Capitan. Note: If you use MacX to rip Disney protected movies, make sure to check the box of "Safe Mode", which will prevent you from problems like unable to find the right title, unexpected halt, video/audio out of sync etc. All in all, MacX DVD Ripper Pro runs fluently and perfectly on El Capitan to macOS Mojave. Different from other DVD rippers on Mac, this program also allows you copy DVDs to ISO image and DVD folder fast and with no quality loss for storage besides ripping protected DVDs to MP4, MOV, MKV, AVI etc for limitless playback on iPhone, iPad, Android devices. Tips: If you want to play the ripped DVD movies or videos on iPhone iPad, you can use MacX MediaTrans. This tool has a strong ability to transfer any movies, music videos, TV shows, videos from Mac to iPhone iPad or vice versa. Superfast speed is kept with unique video format conversion feature to allow you add movies to iDevices in one click.